Read the bottom for giveaway info!!! When I was pregnant, we were hopeing for a boy. When we found out we were having a girl, neither of us was thrilled at first- but we quickly warmed up to the idea! I decided that my daughter would not likley follow my lead with the 'not having any hair until she is 2' thing..... well she did, but that isnt the point. 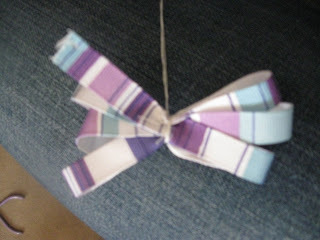 ANyway- I decided I wanted to make some hair bows! You would think this would be easily acomplished by looking on the internet- well not so much!! 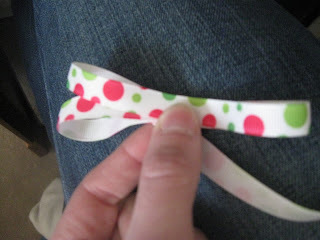 SO here I will put up a little Tutorial so you too can make your own easy and beautiful hair bows! (Hobby Lobby has ribbon on sale right now 50% off! SO go get started!! * A hot glue gun and glue. 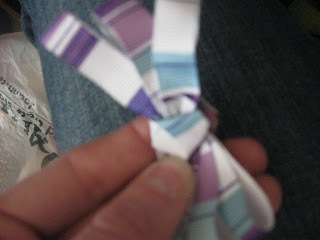 Next, take the bottom (long side) of the ribbon and make another loop meeting the first in the middle. Once you have 6 loops, squeeze it in the middle. Take your needle and thread and starting at the bottom, make about 4 stitches, making sure that each of the ribbon peices is attatched in at least one stitch. 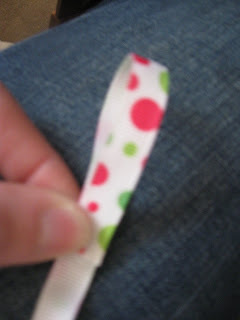 Cut off extra ribbon. (make sure you have enough at the end that it was also sewn in! 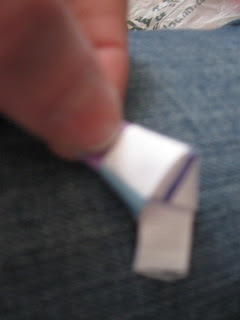 Pull the thread and make the middle kind of scrunch together. 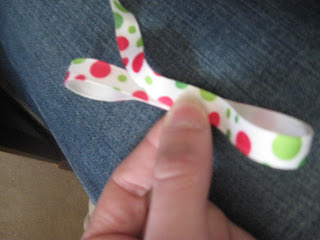 Then take your thread and wrap it around the center of the bow about 4 times. Tie a knot, but dont cut the thread. Set bow aside. 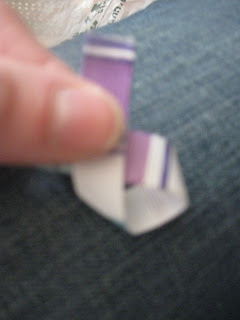 Take a smaller peice of ribbon- still attatched to the spool, and tie it in a knot. Now put the knot onto the top of the best looking side of the bow. cut the tails so they barely overlap in back. Take your needle and thread and sew the two ends together. 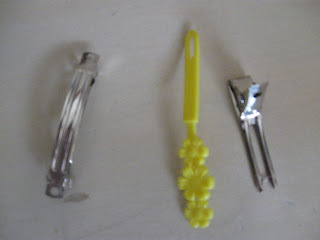 Now all you have to do is put a little glue onto your barette (You could wrap it in ribbon if you have an aligator clip). Just put a lot of glue onto the actual barette and then push the bow on top- all done!! See- SO easy! 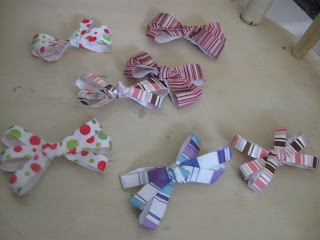 You dont have to buy $5 a peice bows when you can buy a whole spool of ribbon and make a whole set! While I am having so much fun though- I am going to do a giveaway! Leave me a comment with your email addy and which bow is your favorate, (or what color you would prefer if you dont like any of them.....) and I will send you a pigtail set! 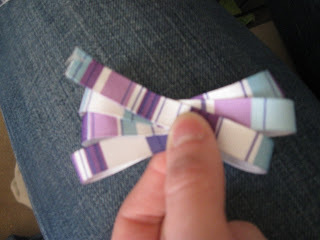 (2 bows!) Its as easy as that!!! You are SO DARLING! I love the polka dots and the pink and brown ones! I'm also WAY excited for the swap! So cute! I'm all about polka-dots! I always wondered how those were made! I love the pink stripes. Josie, you are too talented. Seriously. Man.